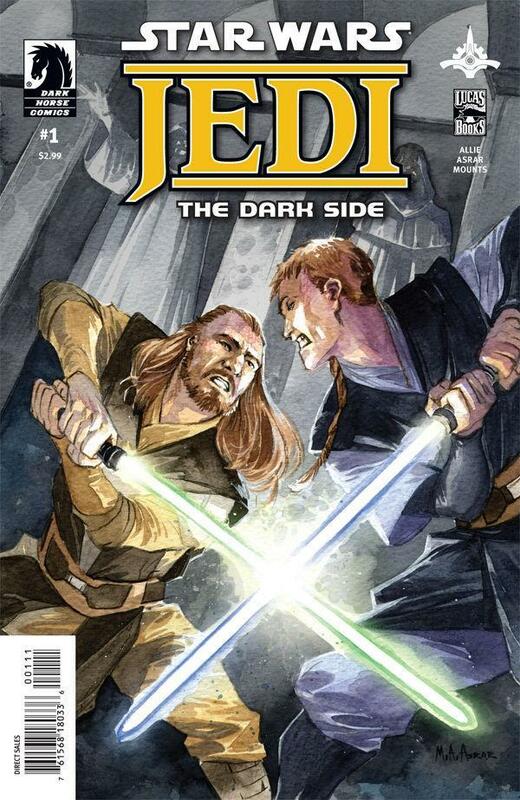 Jedi: The Dark Side is a five-issue series that had its first issue published on the 18th of May 2011, and concluded on the 21st of September the same year. This story arc is the first in the Star Wars: Jedi series, written by Scott Allie (Contributor to various Dark Horse series). It follows the Jedi Master Qui-Gon Jinn, and this specific story arc takes place in the year 53 BBY, which is roughly 20 years prior to the events of Star Wars: The Phantom Menace, which was his first ever appearance in the Star Wars franchise. Jedi: The Dark Side tells the tale of Qui-Gon and his padawan, Xanatos, as they are sent on a mission to the planet Telos IV (which just so happens to be Xanatos’ home planet), to investigate the suspicious death of a High Priestess on the planet. While planet-side, it is revealed to the reader that Xanatos is actually the son of Lord Crion; the king of Telos IV. As the story progresses, we see that there is a growing insurgency on the planet which threatens to explode into a full-blown civil war. All throughout the events of the story, the arrogant young Xanatos struggles to keep a hold on his emotions; He fears rejection and desertion as he believes that his father deserted him by sending him to train with the Jedi, and now believes that Qui-Gon intends to leave him back on Telos IV in place of a new padawan. Jedi: The Dark Side offers a really fascinating perspective on the character of Qui-Gon Jinn, as he shows complete respect for the Jedi Council and advises Xanatos to do the same, however as we all know, by the time Phantom Menace came around, the Jedi Master was receiving this advice from Obi-Wan. In that capacity, Jedi: The Dark Side and the Star Wars: Jedi series overall promise to show a really cool development in the personality of Qui-Gon as we learn why exactly he no longer entirely trusts the council’s opinion in Phantom Menace. All that being said, the plot is sometimes a little hard to follow and at times feels like glorified fan-fiction. Overall though, it’s a pretty well done story and I’ll be keeping an eye out for the next story arc. If you enjoyed the Star Wars prequel movie trilogy at all, I would highly recommend you check this series out. On the whole, I give Jedi: The Dark Side a 3.5/5.